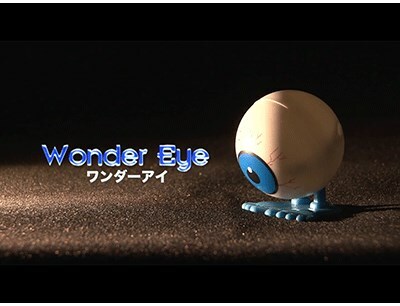 An Eyeball-shaped doll finds your selected card!? There are a lot of magic effects that use a doll or a mini car to find a chosen card in various ways. But with those, the spectator does not freely decide where to place the doll/car to search for the selected card. However, that option becomes possible at last. The magician takes a deck of cards out of a case and shows that each of cards are different. He also takes the Wonder Eye out of his pocket and announces "Today my assistant find your chosen card". Let the spectator choose one card and look at it, also let Wonder Eye see it but not the magician. The magician puts the card in the deck and shuffles. He spreads the cards to four lines on a table to make a 'card' carpet. In other words, the spectator puts the doll on the carpet quite freely. However, Wonder Eye stops exactly on the chosen card. And two more Bonus Tracks! Both are high-impact card magic.